Level 4 Diploma from Ofqual's registered awarding body ABC Awards. Looking for Certificate in Construction Management? 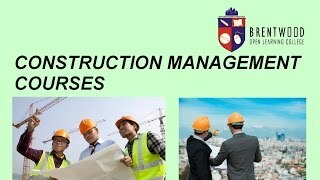 This Construction Management Certificate is best for you Construction Management Level-4. Endorsed Construction Management Diploma from Ofqual's regulated Awarding Body. Careers in Construction Management Certificate really are the stuff dreams are made of. What could be better than a fulfilling and rewarding career, dedicated to building and improving the very world we live in? Not to mention, limitless potential for advancement and extraordinary earnings. The most successful careers in Construction Management - Diploma Level 4 are built upon solid foundations of targeted education. Armed with our highest-level Construction Management Certificate, you’ll soon find that even the sky isn’t the limit! Challenged with planning, executing and overseeing extraordinary project at all levels, Construction managers play a key role in building the world around us. From new developments to the expansion and enhancement of existing structures, Construction managers are expected to demonstrate limitless flexibility and diversity of competencies. Challenged with planning, executing and overseeing extraordinary project at all levels, Construction managers play a key role in building the world around us. From new developments to the expansion and enhancement of existing structures, Construction managers are expected to demonstrate limitless flexibility and diversity of competencies. Construction Management Diploma provides learners with an intensive yet digestible introduction to the contemporary Construction sector and its key contributors. Develop the practical skills, knowledge and confidence to step into the Construction Management profession as a competent and capable leader. Whether looking to join an established Construction organisation or set up your own business from scratch, the teachings and industry insights within this Construction Management Level 4 inspiring course could make all the difference. This inspiring Level 4 Diploma in Construction Management has been designed for candidates intent on taking this remarkable industry by storm. Capitalise on record-demand for qualified Construction managers worldwide, studying a breakdown of Construction projects and supervisory requirements, forecasting and budgeting for Construction projects, building vendor relations, materials management, HR management, workforce deployment, performance management and so much more besides. Take the first step towards the career you know you’re capable of, with the help of Brentwood Open Learning College! Tutor Support is available throughout the course. All learning materials, documentation and digital textbooks provided as standard in the initial course price – no hidden extras or additional costs. Our highest-level Construction Management Certificate has been designed for candidates who are genuinely serious about climbing the career ladder to top-level leadership positions. No prior experience or education is required to get the most out of this Construction Management advanced online study program, which begins with the basics before moving onto more intensive and complex industry issues. This intensive yet accessible Construction Management Diploma is delivered across 10 modules – each concluding with an online assessment to verify your acquired knowledge and competencies. Your assigned tutor will provide you with comprehensive support at all times, in order to assist with your successful completion of each unit. Studying for an advanced Construction Management Certificate comes highly recommended for anyone looking to establish themselves as a true leader in this dynamic and rewarding profession. By beginning with the basics and gradually guiding learners through the most important and complex industry issues, our top-level Construction Management Diploma is open to newcomers with no existing experience or expertise. We design our courses to be as accessible and flexible as possible, with absolutely no deadlines or time restrictions to worry about. Study today for a brighter tomorrow, with a little help from Brentwood Open Learning College! Study Construction Management in your own time and at your own pace from anywhere in the world, with access to professional support from your own assigned tutor at all times. What’s more, all course materials are provided as standard and can be accessed 24/7 via our exclusive digital learning platform. Brentwood Open Learning College works hard to make it as easy as possible for every ambitious learner to both discover and reach their full potential. I can't buy it. Is this course on real or is a fake advertising????!!!! Dear Eduard, The course is real and you can buy this course from the reed. Following the receipt of your fee course access will be provided to you. At the end of the course, the learner can claim an endorsed certificate by paying £120 accreditation fee and postal charges (£9 for UK students, £15 for the outside UK). Do you nee to have completed lower levels? i.e. Level 4 Is there a huge difference between levels? Is this course recognised by employers? Dear Martin, Normally students who want to study a comprehensive course enrol directly on Level 5 course. They are not required to study Levels 1, 2, 3 and 4 for their enrolment on Level 5. The course starts from the very basics and takes you to the advanced level. We, therefore, do not ask for any previous experience in the subject as it suits the beginners as well. The course "Construction Management - Diploma Level 5" is recognised by the employers all over the world.